BUBBLIN MOVES TO ROTTURE IN OCTOBER! We at Bubblin are fully stoked out to announce our first dance party at our new home, Rotture! We’ve loved our time at Crown Room with its massive sound and awesome staff, but are thrilled to be hopping across the Willamette to Rotture’s friendly and spacious Inner Eastside confines. For the occasion we’ve enlisted two of the finest dancefloor fillers around: Brookyln via Miami bass bomber extraordinaire JUBILEE and Pacific Northwest juke/bass sensation CEDAA! 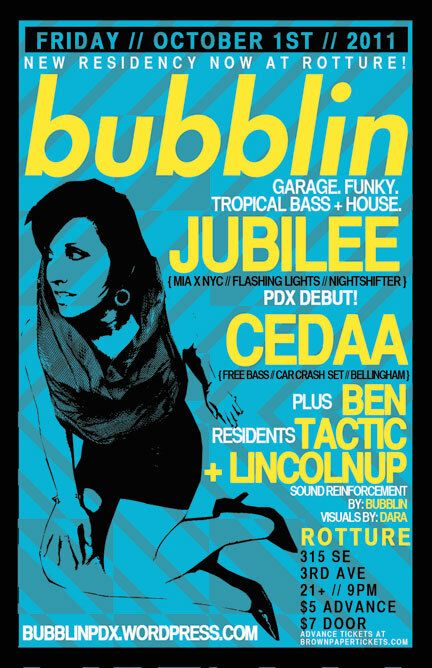 We’ve had Jubilee on our radar to bring out since first commencing Bubblin and are honored to now host her PDX debut. She brings impeccable selections, air tight phrased up mixes, and tru skool rave love to her vibrant dj sets – get ready to work it out PDX. Pac NW upstart Cedaa made his PDX debut at the Bubblin 1 Yr in April, when he was still too young to order a drink in the club! Now, having just turned 21 in late August, he’s back to set things off in his fresh and unique style. Though now splitting her time between Miami and Brooklyn, XLR8R’s “artist to watch” Jubilee will always be Brooklyn’s bass sweetheart. Known for her rambunctious combination of upfront bass music, UK house, and tropical flavors, she has become a surefire remedy for ailing dancefloors around the globe. Co-opting her name from the X-Men character who shot fireworks out of her hands, Jubilee works similar magic when she steps into the DJ booth. But she’s also simply Jess, the one-time South Florida raver who grew up obsessively listening to Miami bass on the radio and dancing the night away at underground breaks parties. After making the move to NYC, she quickly infiltrated the DJ circuit and began turning heads with her knowledge of all things bass. It’s the sweet mix of underground bass and tropical vibes that brings Jubilee from clubs and warehouse parties to the comfort of your own home. Her radio show Fireworks, on both Brooklyn Radio and Electric Soundstage (iHeartRadio’s new electronic station), continuously features fellow global producers such as Sinden, Bok Bok, Mike Q, and Star Eyes. Prior to Fireworks, she has DJed on East Village Radio and put together well received guest mixes for “The Mix Up” on Australia’s Triple J Radio and XLR8R Magazine’s esteemed podcast series. You can also find Jubilee on the production end of things as one half of Bassanovva, a project with Canadian producer Grahmzilla (previously of Thunderheist). The duo’s debut EP, Chicken Lover, dropped this past November on Sinden’s Grizzly label. Be sure to also check out her Paypur EP with Udachi for the Nightshifters label, an imprint she runs with Jason Forrest (a.k.a. Dj Donna Summer). These days we have also seen official Jubilee remixes for some of the most buzzed about artists- Cubic Zirconia (with Proper Villians), Canblaster, and Creep (with Star Eyes). As if that’s not enough, Jubilee also puts on the infamous Flashing Lights party (with Nick Catchdubs and DJ Ayres); named Best New Party at the Paper Magazine 2010 Nightlife Awards. Critical recognition is no stranger to Jess- in 2009, Sasha Frere-Jones invited her to perform at the New Yorker Festival—she was the only DJ on the bill. Jubilee regularly DJs throughout the US and Europe, and you will be sure to see a lot more of her bass-loaded fireworks on both sides of the Atlantic. 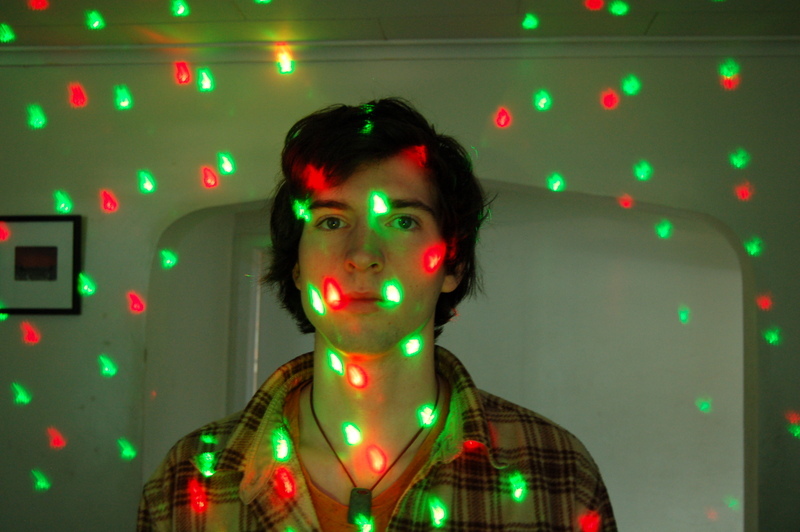 Founded by residents Lincolnup and Ben Tactic, Bubblin puts on dance parties in Portland, OR. The two veteran DJs met in late 2009 at a Gant Man show and bonded over their shared love of music emerging from the funky – house – garage – tropical – postdubstep continuum. From there they decided to establish Bubblin, becoming the Pacific Northwest’s first advocates devoted to these forward thinking sounds. Since then Bubblin has consistentlyfeatured debut Pacific Northwest performances by ahead of the curve artists, such as Roska, Ghosts on Tape, Zed Bias aka Maddslinky, Dubbel Dutch, Distal, Kyle Hall, Nguzunguzu, LOL Boys, Dave Nada, Ramadanman aka Pearson Sound, Dre Skull, and Jimmy Edgar. Bubblin is dedicated to bringing up to the time and timeless dance music to the good people of Portland, OR and beyond. This entry was posted on September 7, 2011 at 8:06 pm and is filed under Uncategorized. You can follow any responses to this entry through the RSS 2.0 feed. You can leave a response, or trackback from your own site.